Here is my first new card of 2018.
panda stamp by Michael Strong. It is a set and the bamboo stamp comes with it. water and black sooth distress ink. Hetty that panda is just adorable. Love the bamboo background. Your card is gorgeous!!! Your 1st card of 2018 is amazing!!! What a fun card, Hetty! I love how you put this together! Thanks for the creative ideas!!! If I find time, I'd love to CASE this!! Great card Hetty!! 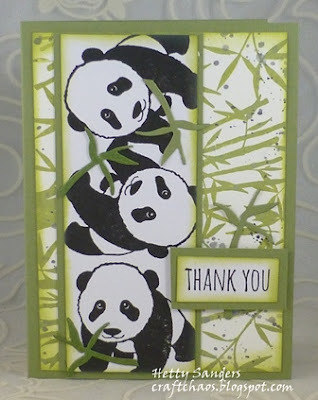 I love the bamboo stamp and the panda stamp! Your card looks wonderful! Thanks for sharing with us at DL.ART Challenges!! Fabulous, love those pandas and the background.